Have you discovered the taste of real tomato? All love stories begin in the same way, firstly you have to meet each other and this is exactly what happened with the Torpedino. The Di Vito’s family business has always been in tomato production and when everyone thought it was impossible to grow a particular variety of tomato with a natural sweetness, they never stopped searching for the perfect answer. Finally in 2007, the Di Vito’s family discovered the Torpedino. Torpedino is the greatest expression of a territory that has always been devoted to the production and culture of tomatoes and this is what makes it an authentic product. 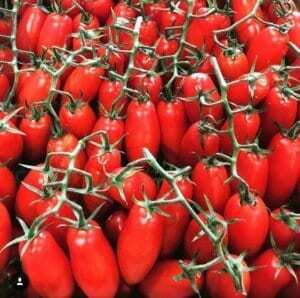 It is a rustic variety, belonging to the family of Mini SanMarzano with a well-balanced relationship between sweetness and acidity, a solid pulp, and very little seeds. In the category of small size fruits this is the only one that can be consumed both red and green and it can be enjoyed both fresh and cooked. The shelf life of this gem extends beyond other tomatoes and will keep perfectly up to 20 days out of the fridge. Torpedino is a product that involves a close and passionate group of producers working the countryside, united by their love for quality, all working to achieve perfection. 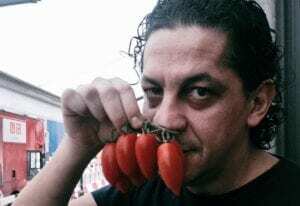 Francesco Mazzei when he discovered the aroma and taste of Torpedino, now a firm favourite within the menus of his restaurants. It’s a four season tomato, fresh all year round. Torpedino grows from May to November in Fondi. When the climate turns cold the Torpedino production is moved to the south of Italy in the Sicilian countryside of Licata and Vittoria. The sun of Sicily can guarantee a reasonable quantity of fresh products from December to April making it a tomato to enjoy all year round. We at Delitalia have fallen in love with this jewel and import it weekly to be enjoyed in restaurants around the UK. Transformed into elegant decoration, garnishes, accompaniments and rustic dishes by chefs hands, it can change the way you think about a simple tomato – have you tried the true taste of tomato? 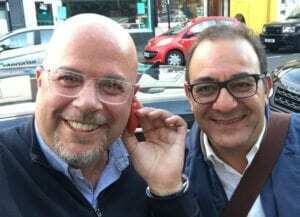 Martino and Mariano di Vito (Mr Torpedino) visit customers across the UK.